What is Employment Assistant Programme? Employment Assistant Programme (EAP) is an independent and confidential resource that employees can use when they need personal or work related practical or emotional support. EAPs are run by different companies who contract with the employer to provide the service to the employer’s employees. Part of the service they offer is counselling. For example, if an employee is suffering from anxiety at work or a bereavement they ring the Employment Assistant Programme telephone line. This is open 24 hours a day. It is answered by a mental health professional who will carry out an initial assessment and sign post the employee to the most appropriate support. This is often a counsellor. The EAP’s have a list of nearby affiliate counsellors and will sign post the client to one of these counsellors. The counsellor who agrees to take on the client has to offer an appointment within 5 working days from receiving the referral. The counsellor will have a contract with the EAP to offer 6 sessions to the client. They are paid for each session by the EAP. The payment is agreed when the counsellor becomes an affiliate. The majority of EAP’s will ask for the counsellor to use Core 10, GAD 7 or PHQ 9 as part of their assessment. They may also require a brief report of each session. The reports stay with the Employment Assistant Programme. Each employee is recognised by a code and this code is used in all communication to ensure the confidentiality of the client. At the end of the six sessions, the counsellor submits the form to the EAP along with their invoice. Payment is within 31 days but that can vary with different EAPs. What do you need to be an affiliate counsellor? 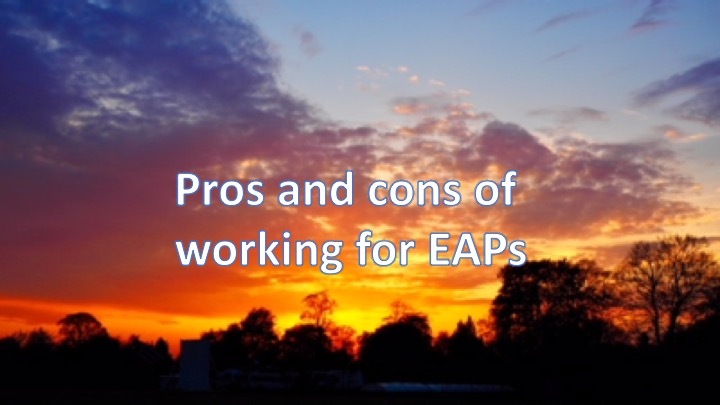 Different EAPs have varying requirements for the counsellors they employ. All counsellors must be a member of the accredited voluntary register. Some require counsellors to be BACP accredited or have a Master Degree. All counsellors need to have their own insurance, have a CRB check and manage their own caseload. What are the benefits of being a counsellor with Employment Assistant Programme? If you establish a good relationship with your EAP, it provides a steady stream of clients. You do not need to market yourself. You receive clinical support. All EAPs have a dedicated case manager who you can ring if you feel you need clinical support with a client at risk. You can use your own counselling model. As long as you work within a six week model, you can use integrate your own model. Increase your knowledge of different companies and common mental health work issues. You are restricted to six sessions. For the majority of clients they are happy with the restricted number. However, for a few it can be feel inappropriate. Endings have to be managed carefully. Pay can be low. This can vary with each EAP. The payment per session can be from £25 – £50 for each session. You cannot take on any EAP client privately when your sessions have finished. Some clients work shifts so it is difficult to manage your diary when they cannot stick to the same time each week. Reluctance to engage – Few of clients are recommended by their employer to have counselling. They are often reluctant to engage in the counselling process. Unless you have a cancellation policy in place, they often cancel sessions last minute. No pay for DNA’s (Did not attend). Different EAP’s have different rules. Many will not pay the counsellor for last minute cancellations or DNA’s. It can raise various ethical issues. You can see clients from the same organisation. Sometimes you are referred clients who do not match your experience or you can have a client that you know. You need to write reports for the EAP. This can challenge confidentiality, as well as be time consuming. You need to self-manage this and ensure all reports are written in a timely manner. You are paid at the end of the block of 6 sessions. The EAP industry has a professional body called the UK EAPA. They are responsible for promoting the interests of the industry, setting standards for delivery of EAP services and fostering the development of EAPs. The main EAPs sign up to this body and you can find a list of these organisations here.